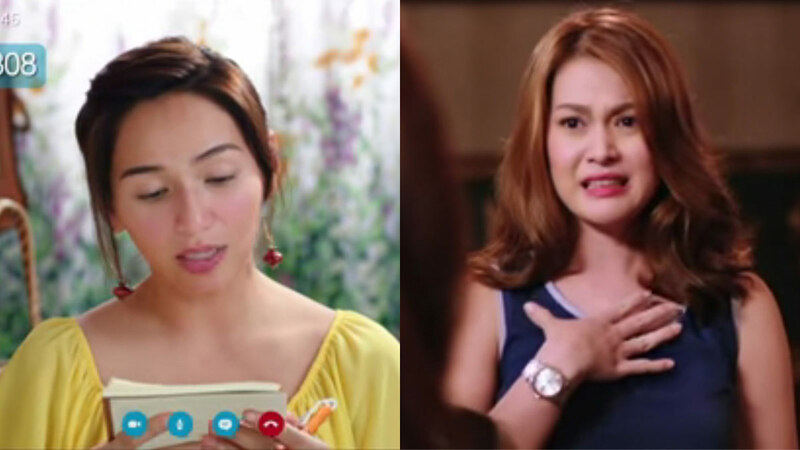 The characters of Jennylyn Mercado (left) and Bea Alonzo deliver some of the most memorable lines from Pinoy movies. Art imitates life but in the Philippines, Filipino movies are able to transcend real to reel and back again. These famous lines from Filipino movies have become canon, often referenced in articles, essays, and movie reviews through the years. This list covers a wide range of films, some as early as the '70s because until now, these famous movie lines are still iconic and relevant. There are even those that have inspired parody movies or comedy versions of it. The ones in the more recent decade have also generated countless memes, especially from the younger generation who can relate to the themes of love and heartache. In no particular order, PEP.ph (Philippine Entertainment Portal) presents this list of famous lines from Filipino movies. How many do you still remember? And how many have inspired other memorable movie lines? Notice how many of them deliver a bite, a sting, and a reverb that can be felt even years later. Notice as well how many of the lines are uttered by strong, woke women making their presence felt in society. Brief Synopsis: Dorina Pineda (Sharon Cuneta in her prime) is groomed by privileged music executive Nico Escobar (Christopher de Leon) to become a singing sensation, largely as part of Nico's vengeful efforts to topple Lavinia Arguelles, Dorina's idol. Lavinia, who Cherie Gil breathed so much life into, was Nico's girlfriend and decided to strike it out on her own because she wanted control of her life. The Situation: This iconic line, often copied, and always, always a second-rate copy at that, was said to Dorina by Lavinia as the former's star was rising and intrigue followed her every step. 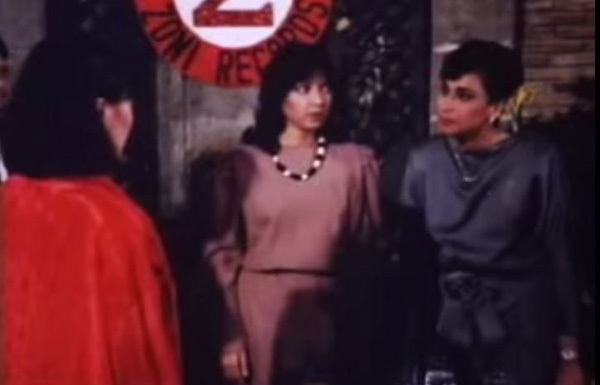 It was uttered in the garden as an adlib by Cherie Gil after the launch of Dorina as ZONI Records' newest recording star. Dorina asked her idol if she liked it and here we have her scathing clapback. Brief Synopsis: Fina and Rodel Alcaraz (played by Vilma Santos and Edu Manzano) are an upscale, seemingly happily married couple—but childless for a while because of Fina's inability to bear a child. 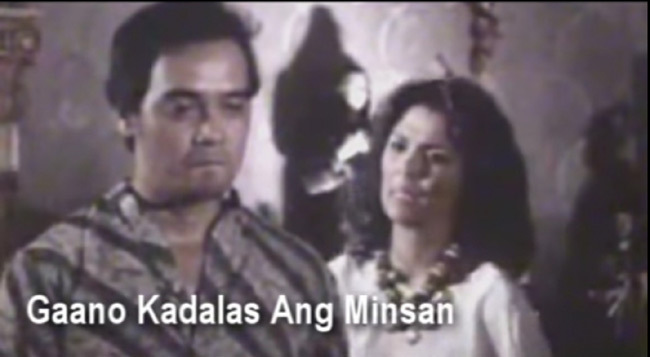 In what proves to be the breakdown of their marriage, Rodel ends up falling for the younger, fertile surrogate, Ditas (played by Dina Bonnevie). The Situation: This line has inspired different screenplays through the years but the OG still stings, as it should. As Ditas, now chasing her dream to have a better life, brings Rodel's child to the home of the Alcarazes, Fina won't take things sitting down, hence this line. Brief Synopsis: Cora dela Cruz (Nora Aunor) is a Filipino nurse hoping to move to America and live in greener pastures. Bonifacio Santos (Jay Ilagan) plays Cora's fiancé. Their families are lower-middle-class families in Pampanga and the story is set during American military presence in the Philippines. Bonifacio is planning to join Cora by enlisting in the U.S. Navy. Cora's brother's death at the hands of an American soldier changes Cora's plans and ideology as she stays in the Philippines and seeks justice for her brother. The Situation: Cora is at home, in mourning clothes, as the authorities explain that her brother was killed in an accident because the soldier thought he was a wild boar. Brief Synopsis: Hugot, friendzone--this movie had it all even before those concepts were coined by millennials years later. Best friends Ned and Bujoy (Marvin Agustin and Jolina Magdangal in their heyday as matinee idols) have been friends since forever. They each pursue their passions (Ned his music while Bujoy takes up art) but their friendship gets complicated when Ned starts dating Bujoy's balikbayan childhood friend Mary Ann (Vanessa del Bianco). Bujoy realizes she wants to be more than friends with Ned and the whole plot unfolds. The Situation: Outdoors in a park, Ned confronts Bujoy and asks her why she is playing the jealousy card. Jolina delivers this memorable line and everywhere, hearts are breaking and tears are falling. Brief Synopsis: Featuring one of the most successful love teams of the recent decade, John Lloyd Cruz plays Popoy Gonzales, an engineer, and Bea Alonzo plays Basha Eugenio, an architect. The college sweethearts from UST are in a long-term relationship but the couple cracks under pressure when Popoy's strong personality stifles Basha's creativity and growth. 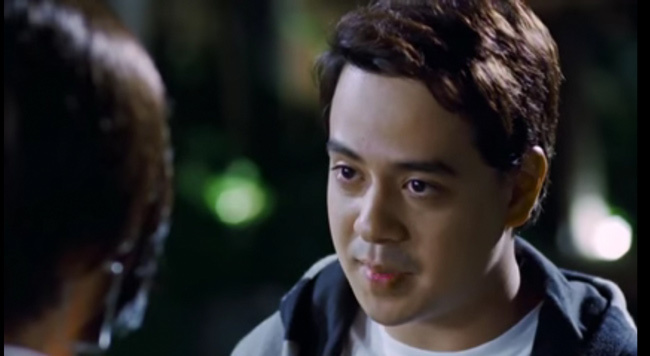 The Situation: Popoy says this very real, very painful line to Basha sometime after their break-up when Basha is thriving in her career and Popoy is now with Tricia (Maja Salvador). Brief Synopsis: Philippine cinema will keep churning out third party-affair movies because they always resonate with audiences. In this prime example of the wife not letting the mistress get her way, Cristine Reyes plays Charmaine Escaler, wife to Ram Escaler (Derek Ramsay). Derek lands a lucrative deal of providing the furniture of a luxury resort owned by Kara Zalderiaga (Anne Curtis) and her family. Kara fancies herself a strong, independent woman capable of carrying on an emotionless affair while Cha learns to fight for her marriage. The Situation: Cha's mother, Babygirl Dela Costa (played by Carmi Martin), reminds her of the rightful place a wife plays in the marriage. This line has both bite and humor and is the battle cry for all wives dealing with wandering husbands, it seems. 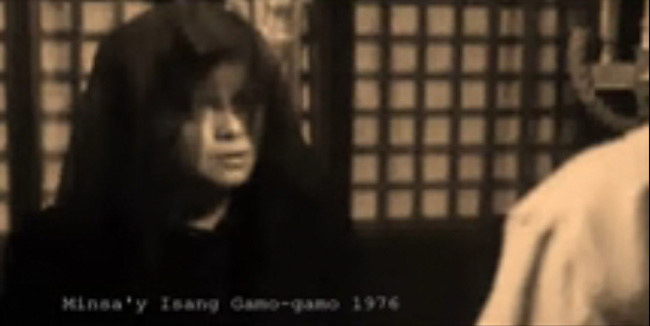 Brief Synopsis: Vilma Santos is Lily Medrano, a single parent to Alvin, a young boy with a certain terminal illness (played by Alvin Enriquez). Her son demands to see his father. The plot unfolds when her best friend, Elsa Almeda (Hilda Koronel), lends her husband Louie (Dindo Fernando) to play the child's father. The Situation: At home, Elsa confronts Louie as the relationship between Louie and Lily has become real instead of just-pretend. Brief Synopsis: After Edward (Christopher de Leon) is abandoned by his wife, leaving him with three kids, he marries the caring and loving Mariel (Sharon Cuneta). She tries her best to be a kind and nurturing stepmother to the three children even as the family explores love, trust, and family dynamics again. The Situation: At home, Mariel confronts Edward about her role in the family as he berates her for chastising him on what to do, because she is "just a wife." 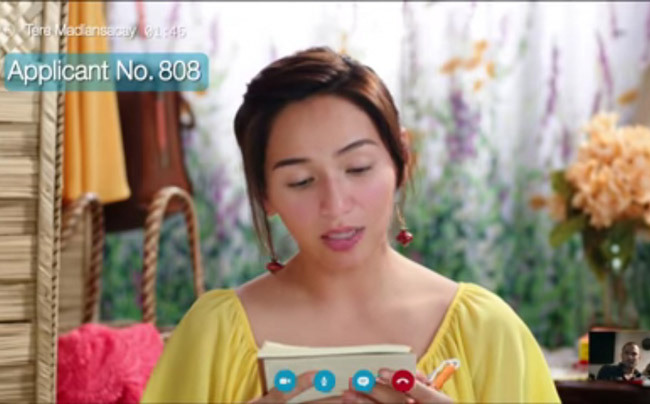 Brief Synopsis: In one of her most recognized roles to date, Jennylyn Mercado plays Tere Madlansacay, a Filipino tutor hired by Julian Parker (Derek Ramsay) to perfectly deliver a letter translation of his emotions to his Pinay ex-girlfriend. The Situation: At a coffee shop, Tere translates to Tagalog what Julian, who is bitter and hurting over his ex, wants to say to his ex. Bonus: “Oo na, ako na! Ako na mag-isa!” ~ Tere (Jennylyn Mercado) to jeepney barker looking for someone: "walang boyfriend, walang asawa, walang kamag-anak!" Brief Synopsis: Teddie (Toni Gonzaga), Bobbie (Bea Alonzo), Alex (Angel Locsin), and Gabbie (Shaina Magdayao) are four sisters who get together to try and dissuade their youngest brother CJ (Enchong Dee) from marrying a woman they feel is wrong for him. The reunion brings out many skeletons that each has kept hidden in their effort to look perfect. The Situation: In the film's big confrontation scene when Teddie's secret is outed, Bobbie also goes under fire for seeming to have everything together. Her response and facial expression have launched countless memes. Admit it: you have already used these famous lines from Filipino movies in various situations. These memorable quotes from Pinoy movies have already become part of pop culture and will continue to entertain viewers for years to come.